Passive avoidance test (Step-through type) | O’HARA & CO.,LTD. The step-through type light and dark experimental box has a distinctive shape. Using this type of shape allows for more stable measurements in each subject. Photo beam sensors automatically detects when the subject approaches the light box. In the 1-5 chamber system, there no need for a computer and software. 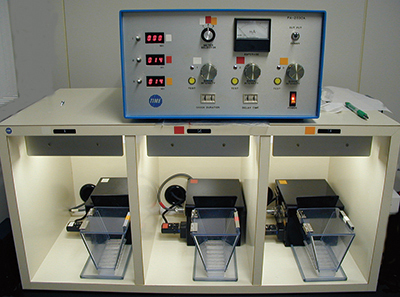 The test is performed and measurements are analyzed with only the use of a control box, making the experiment simple and easy to operate. This entry was posted in Products and tagged Multi-Chamber System on 7月 23, 2015 by admin.